Place here a short description of the module, this will appear in the list of the modules. A module combining multiple libraries and modules from the iCub repository that allows to execute some basic and complex actions on objects placed on a table in front of the robot. Just an example of how to control the iCub arm in the operational space making use of the Cartesian Interface. A simple service that allows you to send constant time position commands to any of the robot ports. Estimates the gravitational contribute to motors based on estimation of the robot dynamics. Just a container which runs the Cartesian Solver taking parameters from a configuration file. Gaze controller based on iKin. Receives an rgb image, depending on the image type the user wants to work on (YUV or HSV) the module extracts the Y, U and V or H, S, and V planes and performs centre-surround processing with a construction of uniqueness maps (intensity saliency, colour, hue, saturation and value ) via a difference-of-Gaussian pyramid filter bank. Provides a on-line yarp-oriented database to collect properties of objects that are of interest for your specific application. This module reads the raw tactile sensor values, compensates for the (thermal) drift of the sensors (basically it is a high pass filter) and writes the compensated values on output ports. This module expects a template from the following port /templatePFTracker/template/image:i in order to commence tracking. Perform position control using a velocity control loop. Estimates the first and second derivatives of incoming data vector through a least-squares algorithm based on an adpative window. Estimates the external forces and torques acting at the end effector through a model based estimation of the robot dynamics. This module is the physics simulator of the iCub robot. 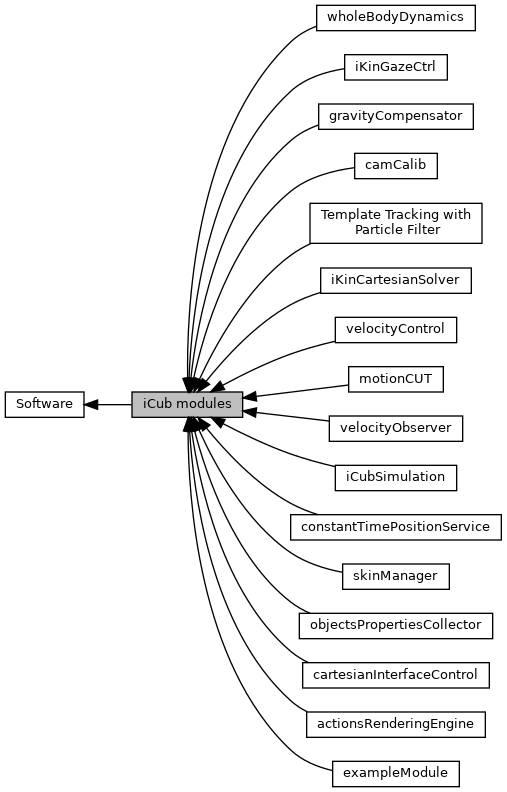 This is the list of iCub modules, i.e. For convenience, try to keep the module name the same as the directory it is placed in. If you've a good reason to do something different, of course you can do that too.